The closer winter is, the more fans of skiing are thinking about what resort to choose for vacation. And of course one of the most important goal is to find hotel to your preferences. Continuing our project “Hotels At First Hand” we would like to present you one of the best luxury and comfortable hotels in Switzerland – HUUS. Our sales manager Taisia Kuriato managed to interview the General Hotel Manager Mirka Czybik. T.K. : Could you tell a little about location of the resort, its sights and natural peculiarities? M.C. : Yes, sure. HUUS lies near Gstaad in the Bernese Oberland, and radiates hospitality and local tradition. From the hotel opened stunning views of the mountains, and our guests have the opportunity to watch incredible sunrises and sunsets. T.K. : A note for those who are in love – your hotel is also a great place for a romantic getaway! And what is the concept of your hotel? M.C. : Our goal is to provide maximum comfort to guests. HUUS means house or home. HUUS is a new, different, relaxed kind of hotel. HUUS feels like coming home to a good friend. Our slogan – “Come up, slow down”. Back to serenity, to the alpine mountain region, to an active immersion in nature. Our rooms are warm, welcoming and comfortable, designed to be in harmony with nature. The finest quality, accented with a modern flair. Therefore, I can say with confidence that HUUS is far more than “just” a new hotel – HUUS is a destination. Our good “HUUS spirits” know how to bring a smile to our guests’ faces every day. Welcome to the natural beauty of Saanen! T.K. : This is great! I believe that such an atmosphere will be especially pleasant for people who work very hard and do not spend enough time in their home coziness. But the main reason of our tourists travel to Switzerland is skiing. So, why should they choose a resort where your hotel is located, and as a result your hotel? M.C. : Good question! And I will answer on it with pleasure. Here is all yours: mountain biking, rock climbing lessons, river rafting, abseiling, nordic walking, guided hikes and much more. In cooperation with the Alpine Centre, we offer our guests a broad program of activities, which of course, are all included in the room price! There’s also the HUUS ski school, ski rentals, free demo skis, the shuttle bus and much more in the winter. T.K. : Oh, I also wanted to ask you why the hotel's main entrance is not at the bottom, but on the top floor of the hotel? M.C. : We are often asked this question, I will explain. Everything is very simple. You see, the hotel is built on a slope, so it's much more convenient to move from top to bottom, isn't it ? T.K. : Really, mature decision. And you know, I was very glad when I entered the hotel and saw dogs! M.C. : Yes, this pug-dog Charly and her friend Piet, the French bulldog, are our favorites. They are the face of our hotel, they performs different commands. We are pet friendly hotel, so we are welcome guests with pets. T.K. : This is amazing, I guess children excited about this fact. Now I would like to ask you a question that people are most interested in when choosing a hotel. How can you describe your accommodation facilities? M.C. : First of all we offer comfort for our guests. We don’t just sell rooms, we create experiences! 136 rooms in three categories with the finest quality design are just as comfortable as they are cosy. The HUUS feel-good factor guaranteed! We have single rooms, double rooms and suits. T.K. : Could you please share your opinion about the rooms? M.C. : Gladly. The single rooms are perfect for those who like to spend time alone and in unity with nature. After an activity in the mountains you can sit in a comfortable chair reading your favorite book and at the same time watch the stunning view opening from the window. Our double rooms suited for couples, little families with a child or for little company of friends – maximum number of people 4 adults. As for the suits, this type of rooms accommodates a large number of people, so it will be comfortable for big families or big friend’s companies. T.K. : Wow, pretty cool. And how does your hotel relate to the personal wishes and eating habits of the guests? M.C. : We really appreciate our guests and want to provide them with better conditions for rest, so we always try to fulfill their wishes as much as possible. Whether a gourmet menu or a hamburger. Whether a breakfast buffet or nightcap. Whether a fiery BBQ or a cheese fondue in a cosy chalet. Embark on a gastronomic HUUS journey with seasonal recipes from the Alps and products from the region. T.K. : Perfect! Now let’s talk about events. Does your hotel conduct some concerts of modern singers/bands/performances/workshop etc.? M.C. : Well, for now we do not conduct such large-scale events, but we have DJ performance every Thursday, Friday and Saturday. T.K. : That’s good, I guess young people are not bored here in evenings. What more can you offer for young people? M.C. : As I said before, we have a lot of different activities here like mountain biking, rock climbing lessons, river rafting, etc., so no one be bored at our hotel! And in Gstaad there is a large sports center, where you can choose an activity to your preferences. Also we have more relaxing options. There are SPA center, pool and sauna at the hotel. T.K. : This is a big plus. And what about families? What your hotel offers for family vacation? M.C. : HUUS welcomes families! Caregivers lovingly take care of your children, both during a special day program as well as at dinner in the Kids-Restaurant. So parents can spend some time together, without worrying about children, they are in right hands. And what's really cool, the HUUS ski school is free of charge to children up to the age of 9 and the mountain cable car is free for children up to the age of 9. T.K. : I think this is very comfortable, as parents don’t have much time usually to spend together. And it should be noted that the ski school for children is a great idea, because not all children know how to ski. And how popular is your hotel? I mean from which countries do your tourists usually come from? M.C. : It's nice to say that tourists come to visit us all over the world! T.K. : Impressive! That’s says a lot. Bringing to an end our conversation I want to ask you one more question. What are the best means of transportation to reach the hotel from main airports and railway stations? M.C. 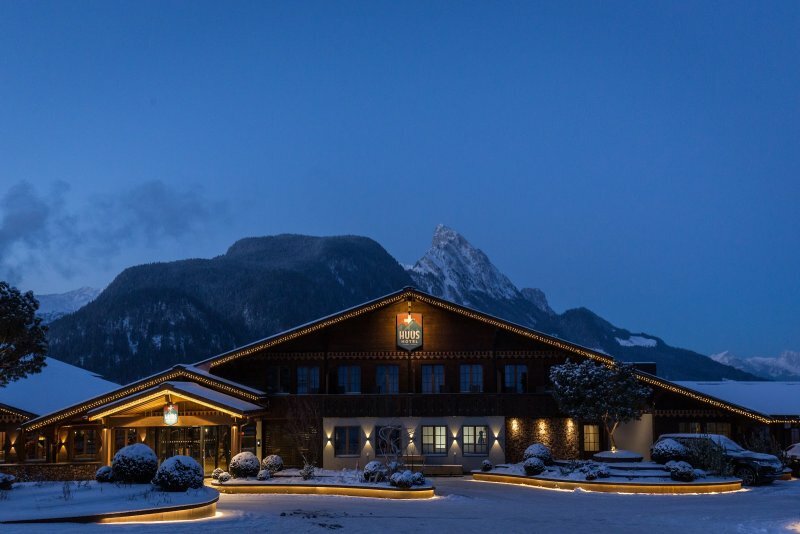 : You can easily reach us from the train station in Saanen, Gstaad and Schönried.